Just as everyone in any civilized country, I found December 8, 2010 a somber reminder of a loss not just to music but also to the world. Every newscast, even al Jazeera, made note of the three decades that have passed without John Lennon. I was sitting in a car outside a friend’s house and we were discussing the strengths and weaknesses of John & Yoko’s Double Fantasy LP when his mother walked out of the house to let us know John had been shot. We were almost too stunned to turn on the radio to hear the news. The local FM station was playing the song "No Reply" when my friend’s mom walks out again to tell us the chilling news that John had died. His day of loss as well as his birth, much like Elvis, will be celebrated and mourned for many decades to come. 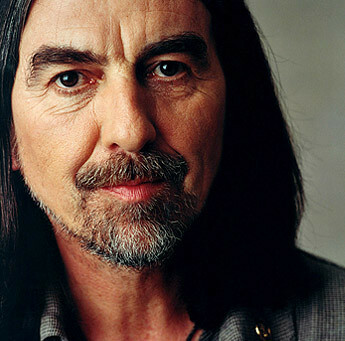 I could not help but take note that there is also another Beatle no longer with us – George Harrison. I understand that, from the beginning, John was more the face of the public Beatles, socially and politically, more so than Paul. Perhaps it was the way they each died, a homicide and a dreaded disease that set John and George apart in the reminiscing world. I didn’t catch a single mention of the nine years without George on November 29, 2010. For his birthday on February 25, other than a few “Celebration of George” nights at local pubs, little in the media will be mentioned about the man who influenced so many. I plan on inviting some of my closest friends to come to dinner where we will watch videos and listen to music featuring George and I will remember the afternoon and evening I spent with him 12 years ago and how touched I was by his inner peace and spirit. I had the good fortune/torture of working closely with Scotty Moore, D. J. Fontana (Elvis’ original guitarist and drummer), along with a host of Sun Records-related artists, for 14 years. I take partial credit, along with Carl Perkins, in bringing Scotty out of a 24 year, self-imposed exit from the music business. By 1999, Scotty had been back in the public eye for six years. Scotty had seen his autobiography That’s Alright, Elvis published and had garnered a Grammy nomination for the All the King’s Men CD and, thanks to my badgering RCA for years, finally received gold and platinum records for the many Elvis songs on which he added integral guitar tracks. He had also agreed to tour the UK with D. J. and a seasoned band of British musicians. We started in Glasgow on our spring 1999 tour of the UK and played all over Scotland, England, and Wales. By the time we got to the south of England, Scotty, D. J., and the band were incredibly tight and the audiences large and wild. The Saturday night show at the renowned Mean Fiddler was something akin to Beatlemania - even down to sneaking though alleyways to a waiting car. The following day, I accompanied D. J. to the BBC Radio London Studios for an interview with the great Joe Brown. Scotty had to bail on the interview because of overexertion from the travel and too many handshakes and autographs. During the interview the producer, Geoff Barker, tapped me on the shoulder and said I had a phone call. He said it was George Harrison. I played along with what I was sure was a joke but much to my surprise it actually was my favorite Beatle. 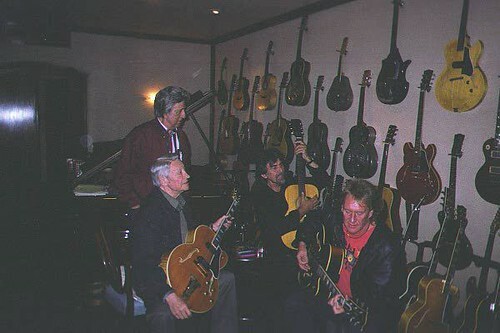 Joe Brown was George's closest friend and, when he learned that Scotty and D. J., two of his earliest heroes were in town, George and his wife, Olivia, wanted to invite them to their home for dinner. We had only one night off that week and would have to drive from the middle of nowhere in Wales back to London overnight to make the date. We did. Initially, the invitation was for Scotty and D. J. only. Joe Brown explained that George did not like mangers! Despite the dejection, I knew how great it was for them to meet him. Joe casually mentioned to George that I had worked with Carl Perkins and Sam Phillips and that changed his mind. I was thrilled to be invited along and was equally thrilled when George called to ask if it was OK if his neighbor, who wanted to meet Scotty, joined us for dinner. The neighbor was Alvin Lee, another of my early guitar heroes. Most of our one day off was spent recuperating from, as Jackson Browne sings, too many shows in a row, and the grueling drive back to London from Wales. George sent a driver in a town car to pick us up at our London hotel and we had a nice 40-mile ride to the little village of Henley-on-Thames. It was only while driving through the gate to the enormous estate that it finally hit me that I was about to actually be in the presence of a Beatle - at his own home. As we pulled to a stop, a golf cart rounded the back of the house and I saw the “quiet Beatle” with a beaming smile on his face. I will never forget the welcoming look on his face and was taken by how he embraced all of us as Joe introduced each. George seemed genuinely excited to meet two of his own heroes. I was taken by the lack of servants on hand to usher us into the castle, but it was nice surprise to have George, alone, invite us into the kitchen to sit around a small table while he made tea and coffee. Yes, George made the tea and coffee. It was later in the same year when the crazed person broke through that very kitchen window and stabbed George until Olivia and their personal assistant, Rachael, beat him to a pulp. I couldn’t help but think that, ten years earlier, I never would believe I would be sitting at a table with Scotty Moore and D.J. Fontana sipping tea with George Harrison. Just above Scotty's left shoulder on the wall was one of the original Elvis, Scotty & Bill promo photographs in the Western shirts. The 8x10 had been autographed by all three and George was thrilled when Scotty, the only living expert, verified the signatures. It was especially rare in that Elvis had signed his name only with no other notation. Olivia had given this to George for their anniversary and now it was a verified unique gift. They had just returned from the US where he had received a clean bill of health from his throat cancer treatment and enjoyed visiting their son, Dhani, in Boston. George sat with us around the table and seemed, against type, to be bubbling over with conversation and questions. George offered to take us on a tour around the estate but Scotty was still tired from the late night trip back to London. I did get a chance to glance into the back where the gnomes from the cover of All Things Must Pass lay in the grass. Once again a rush of disbelief hit me. When we came back inside we were introduced to the lovely Olivia Harrison and, shortly afterward, Alvin Lee arrived. We sat in a very comfortable living room where lodged the legendary multicolored jukebox which George programmed for his favorite song, "Barnacle Bill the Sailor." I was impressed how George maintained control of the conversation and made sure that each of us participated, as opposed to him focusing entirely on Scotty. That would come later in the evening when the guitars were taken out of their cases. George wanted to know about my all too brief work with Carl Perkins and told us of his experience going to Carl's funeral. He and Olivia had wanted to quietly pay their respects to his old friend but the circus atmosphere took them by surprise. He made a point of expressing his displeasure of having a guitar shoved into his hands by Billy Ray Cyrus and of being lead to a basement room where he was joined by, (his words), “that guy in the hat, (Garth Brooks), and that "big woman," (Wynonna Judd). He couldn't see how they fit into the service other than to make themselves part of the spectacle and he was not comfortable being expected to perform for an audience that included Johnny & June, Sam Phillips and Jerry Lee Lewis. Scotty had gone to the wake the night before but sensing the Nashville-ized nature of what would happen, he opted out of the service. Good-natured George complied and played a moving rendition of Carl's "Your True Love." He also told us of the bizarre occurrence as the pallbearers were taking Carl from the church. Just as they got to the aisle seat held by Sam Phillips, they stopped and a puzzled Sam placed a hand on the coffin and they moved along. George’s recollection to us was in no way mean-spirited, he was more confused at the ritual. Olivia and Rachael had prepared a wonderful Southern-style dinner and I was beyond excited to be sitting between Mr. & Mrs. Harrison. The conversation remained strong through dinner and at one point George asked Scotty & D. J. if they had to sign autographs at shows. We explained how we sat up a table after the performance and they signed until every fan had their token for the evening. George smiled and said, "Wouldn't you like to strangle the person who began that tradition?" I figured there would be no Beatle autograph in my future. When the conversation turned to Alvin and Joe, Scotty and D. J., I had my chance to talk music with George and asked what he was working on. He told me of the jam sessions and songwriting he was doing in his music room and studio with any friends who would drop by including Gary Brooker, Alvin and Joe and many others in his circle. I commented that he was my favorite slide guitarist and I decided to give up my attempt at the craft when I realized I could never be as good as him. He seemed to actually be nicely embarrassed by the compliment. It was also very sweet that during the entire evening he only referred to the Beatles as, “my old band.” I asked Olivia if he was always this open and genial. She said it was rare for him to feel immediately comfortable with a group of new people but as it was his early heroes along with his two best friends, he was comfortable and fully open. I knew Scotty was very tired and was afraid he would ask to leave as soon as the meal was over. To my surprise, he lightened up when George asked if we wanted to go into his music room/studio. As we entered, I had to keep from being overly enthused about standing beside a wall of every guitar George played with the Beatles and on his solo and Wilbury’s material save for one, his cherry red Gibson SG which he gave to Delaney Bramlett in 1970. This was the guitar he used in the Revolution video and the reason, as a kid, I wanted that exact guitar for my first good instrument. He showed me around the room and pointed out all the different guitars and stringed instruments. There was one given to him by Bob Dylan and the one he saved his money and rode his bicycle to the docks to by from a drunken American sailor. He also showed me a cushioned bench where sat a small group of puppets surrounding what I assumed was a Charlie McCarthy replica. He told me it was not not a replica but the real one and that it was one of his prized possessions. He seemed to be as proud of that piece of Americana as any of his instruments.George let Scotty pick out the guitar of his choice, as did Alvin and Joe. D. J. and I just stood around waiting for the show to begin. I was taking pictures and film with George's camera when he broke out a Balalaika, a Russian guitar, a proceed to play and sing "Trying To Get To You," my favorite Elvis song. Scotty knew it well from the set list of the tour so he and Alvin played a wonderful rendition with George's singing so beautiful - thankfully Olivia has the film. George asked Scotty if he could play him the solo on "Too Much" a song from the Sun Sessions. Scotty told him he had not played it since they recorded it and couldn't remember it. George said, "That OK, I can't remember "A Hard Day's Night" either. While the heavenly jam was going on with Joe singing old Elvis songs with George, Scotty and Alvin, I had a look around the music room and studio, which was covered in tapes of all formats, scattered about. Some were labeled and some not but the ones labeled contained titles like "Jack Bruce & Alvin" or "Gary Brooker, Steve Winwood," "Bob" whom I figured was a jam with Mr. Dylan, practically everyone who came to his house got the music room treatment. I was thrilled to see Scotty and D. J. having such a good time but George's face showed his thrill of playing with his heroes and friends - and loving every minute.